Bedlam Plus is a new aerosol insecticide by MGK offering a longer lasting residual than the original Bedlam with the addition of Imidacloprid. 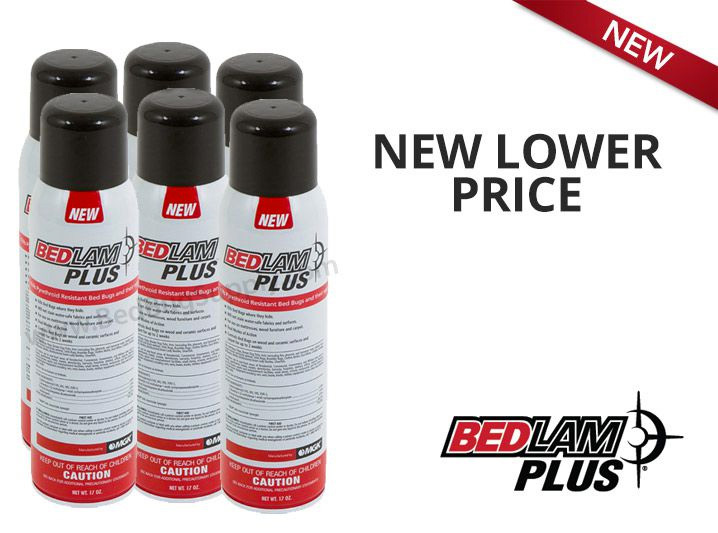 This longer lasting residual additive along with an updated formulation gives Bedlam Plus the ability to kill all stages of bed bugs, their eggs and even pyrethroid resistant bed bugs. It is very important to mention that Bedlam Plus is solely a crack and crevice spray and should not be applied in areas that may come in contact with skin. For mattress applications, Bedlam Plus is designed to applied until damp along the folds, tufts and edges of the mattress and not on the top surface where we sleep. We like to use Bedlam along the folds of mattresses, sofas, chairs and on drapes and other fabric materials that do not come into contact with skin. 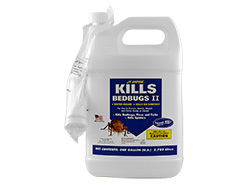 Bedlam is a residual in that the ingredients remain active for several weeks allowing it to continue killing bed bugs. 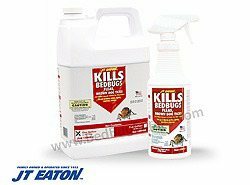 The only drawback to Bedlam is it's more expensive than other non-aerosol residual killers such as our JT Eaton Kills Bed Bugs II. For best results, in addition to treatment with Bedlam® Insecticide, you should include additional tactics such as those listed below. Conduct a thorough inspection to locate the infestation. Be certain to look in harborages that offer the bed bug isolation and darkness. Remove bedding, clothing and other items that may be laundered or dry cleaned. Wash and dry on “high heat” dryer setting to acheive a temperature of 185°F. Q: Is there a guarentee on your product? Since we are only selling you the product to use yourself (rather than performing the treatment ourselves), we cannot guarantee that you will follow the proper treatment methods, and we cannot guarantee that you won't skip any steps or miss any areas in the room. For those reasons, we cannot make any guarantees on the products that we sell. Q: IS THIS PRODUCT OK FOR PREGNANT WOMEN AND CHILDREN? All of our chemical products have labels on them that instruct on safe and effective usage. As long as you follow the instructions correctly, then they are perfectly safe. If you're still not sure, consult with your doctor before use. If you scroll up below the product picture you will see the "product label" in PDF format, which lists the ingredients. Q: does it kill dust mite? Yes, dust mites are one of the target pests listed on the product label. Please make sure you read and follow the label and MSDS for safe and effective usage. Yes, each can purchased will come with a straw. Q: How long does the residual last? It does not say. As stated in the description and on the product label, Bedlam Plus lasts for up to 14 days after being applied. It works and kills quickly! Reviewed by: mark from New York, NY. Reviewed by: Maria from Inland Empire. Reviewed by: barbara rosabal from huron,Sd. This is an excellent product that works very well. Reviewed by: Felicia from Chicago. We spent about $2,000.00 to have our home "heat" treated to get rid of bed bugs. That including having to remove everything from the walls, candles, chemicals, clothing (after heating everything in a hot heater for 50 minutes and sealing in plastic bags). It was like moving away...and then having to move back in. After three months, we saw the bedbugs come back. I ordered the Bedlam Plus Bed Bug Insecticide Spray Aerosol (residual spray). Yes, it works...we killed bugs hit with the chemical, treated everything explained by the included instructions...NO BUGS. Thank you sooooo very much. Yes....it works! And the price, $18.00 per container, is a lot less than the $2000.00 we spent for the "heat" treatment. Reviewed by: Charlie Christian from Hilliard, OH 43026. Battled these monsters with everything before getting the Bedlam Plus spray and it seemed like the bugs didn't mind. In a single, short direct spray of this stuff, the nymphs seemed to liquify and adults dropped dead on the spot. Within a week of a multi-pronged approach (using this spray on almost everything bed bug accessible, 2 bed bug mattress protectors bought from this site, putting 3 heaters in the room and raising room temperature to appx. 110 degrees for 6 hours, and applying the bed bug monitors/traps to everything w/ legs on it, our bed bug problem seemed to disappear. It's been about 6 months and not a single one has been spotted, indicated, or otherwise us being bitten. 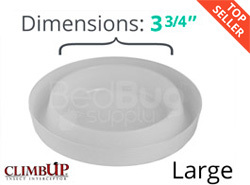 If it weren't for wanting to keep the bed bug infestation private, I'd praise this product very publicly. Reviewed by: TJ from New Jersey. Kill them dead,great spray,works fast,highy recommend. Reviewed by: Howard Jones from Florida. I am more than satisfied with the results of this product. Reviewed by: bob from oxnard 93030. I spray it around my bedding and base boards. I haven't seen any lately but do show signs of bites. It's been only a couple of weeks and can only hope it does the job. Reviewed by: Ralph McBee from jackson ms.. This product seems to be doing the trick. The exterminator my apartment leasing company hired has trimmed down the infestation, however, the bugs have to go through the treatment before they die, and in the meantime, they're still biting. Bedlam Plus seems to be doing the job...have had no bites in several days. I'm spraying every nook and cranny of my headboard, baseboards and carpeting around my bed and am very pleased with the results. Reviewed by: Karen Middleton from Lincoln, NE.